Indulge your guests with this delicious oriental main course. 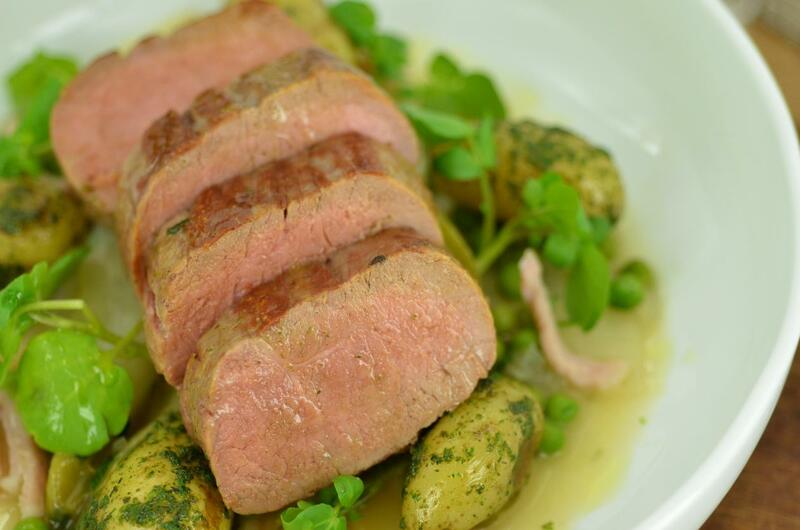 Try the scratch recipe version of the roast lamb loin or the time and cost saving UFS Version. Boil the potatoes for 10 min. then drain and allow to cool until needed. Blend the herbs and oil together then set aside until needed. Season the lamb then seal all over and roast for 5-6 min. then remove, cover and allow to rest. Peel and dice the shallots then sweat with the bacon for 2-3 min. then add the chicory and peas then pour in the stock. Bring to the boil and cook for 2-3 min. then remove from the heat and add in the butter, mintand stir to create an emulsion. Reheat the potatoes then toss in the herb oil. Spoon the peas into a serving plate, slice the lamb and sit on top. Add the potatoes and garnish with the watercress.